Family Bovidae: Cattle, antelopes, sheep and goats. metapodial limb bones fused into a single, elongated cannon bone. Furthermore, ruminants are generally gracile (slender or light in build) and mostly bear horns of some description. 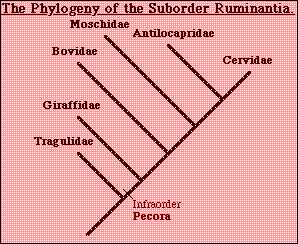 All the ruminants except the tragulids are in the infraorder Pecora (the horned ruminants). FAMILY TRAGULIDAE : THE CHEVROTAINS or MOUSE DEER. 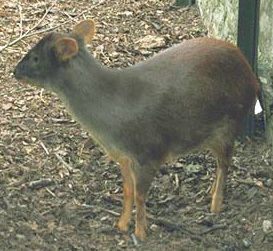 The chevrotains are a small family of very primitive, forest-dwelling, deer-like ruminants. They are found in the forests of South East Asia and West Africa, often close to streams. The smallest are no bigger than a rabbit. These are the most primitive modern ruminants. They are regarded as being intermediate between the tylopods and the ruminants. Sometimes they are included in the Tylopoda, but generally they are considered to belong in the Ruminantia. 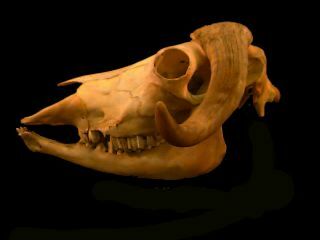 A mixture of archaic and derived features demonstrates their status as the most primitve ruminants. all 4 toes well developed. poorly formed 3rd stomach chamber (4 chambers present). their behaviour often similar to pigs (no visual display). the mother ingests placenta after birth of lone calf. One genus - Moschus - of three small, forest-dwelling species. Males lack antlers - instead they have large canines. The hind legs are longer than the fore legs and musk deer move fast by leaping. Hopefully the farming of these deer for musk in China will safeguard their future in the wild. Musk is used in perfume, and can be removed from the gland without killing the animal. The deer are characterised best by the presence of antlers (deciduous horns although they are really just bone without a horny covering) in the males, although not all members of the family possess them. The cervids have spent most of their history, and are still mainly found, in the temperate forests of the northern hemisphere, although South America was reached in the Pleistocene. The cheek teeth remain low crowned, as deer are browsing animals and suffer less wear on their teeth than grazers. Few features separate them from other ruminants. The pudu (Pudu pudu) is one of the few ruminants to cross to South America after the Panamanian isthmus formed 2.5 million years ago. Most cervids are found in the forests of the northern continents, but the pudu is found in the extreme south of South America, in Chile and Argentina. 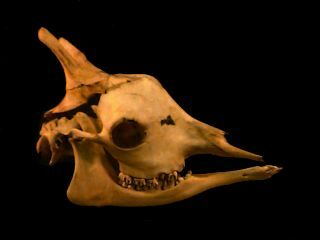 The pronghorn, Antilocapra americana , is the only modern member of this family, which contained 5 genera in the Pleistocene. The pronghorn has horns that consist of a bone core covered with keratin, as in bovids, but the keratin is shed every year like the antlers of deer. Seventy years of persecution by white settlers reduced the 50 million pronghorn on the prairies of North America in 1850 to a mere 13,000. Today, their numbers have recovered a little to 450,000 pronghorns. The two modern members are the primitive okapi and the familiar giraffe. 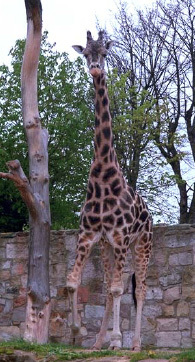 A giraffe (Giraffa camelopardis) from Africa. Early giraffids resembled the okapi. Later giraffes included Sivatherium, a massive, ox-like animal with huge horns like those of an elk. A piece of ancient Sumerian jewellery depicts what appears to be a sivathere, suggesting that this animal may have persisted almost into recorded history. This frontal view of a giraffe allows several important features to be clearly seen. The huge two-toed hooves carry the animal, and are used as weapons should a giraffe ever need to discourage the unwanted attentions of a lion. Giraffes are accomplished runners too - they are able reach speeds of 50 kilometres per hour if they feel threatened. The long neck, high shoulders and long legs all serve to raise the head to a height of up to 6 metres, allowing it to reach browse out of reach of all other ungulates, including the elephants. There are problems associated with this tremendous height. In order to drink, giraffes must stand with splayed front legs, or with its fore legs bent awkwardly. 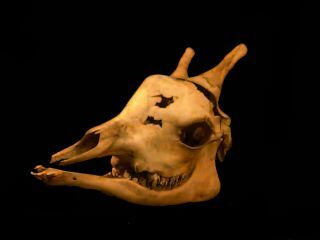 The giraffe skull shows typical ruminant features, but giraffes are unusual in that they are born with horns. The laying down of extra bone on the forehead and above the eyes can give the misleading impression of 3 or 5-horned giraffes. The head of a giraffe, showing the bony, skin-covered horns. 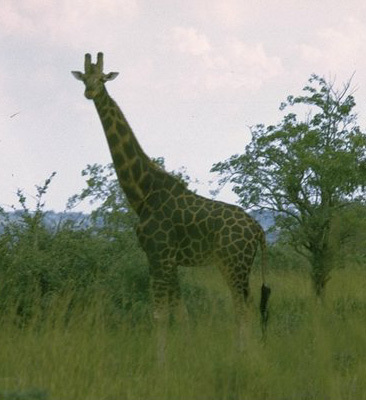 Giraffes mostly inhabit open woodlands and wooded grassland in sub-Saharan Africa. They are highly selective feeders, taking high quality food from trees (males) and tall shrubs (females). 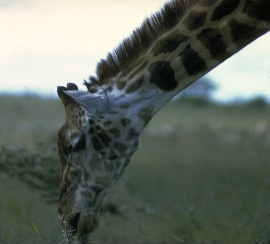 Giraffes do not live in fixed social units, but feed in loose herds. 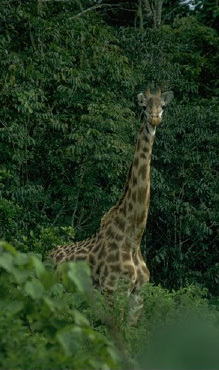 Some giraffes are also found in forests. Giraffes are hunted by subsistence farmers. They may be farmed in the future, as they browse on plants not used by other livestock and will hopefully replace sheep and goats which overgraze. This hugely successful family includes a total of 120 extant species of bovid, in 6 sub-families and 4 genera. This family includes the musk-ox, bison, antelopes, duikers and several species important to man - cattle, sheep, the yak and goats. Bovids are found throughout Eurasia, Africa and North America. Africa is probably their stronghold. 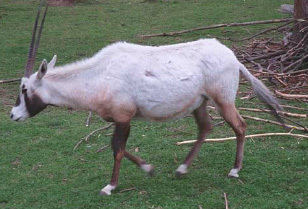 There is more variation in form within the family than between the bovids and other ruminants. They range in size from the tiny duikers to the huge cape buffalo. Horns (non-decidious keratin on bony roots) are usually borne by both sexes. Many bovids live in herds, probably for defence. 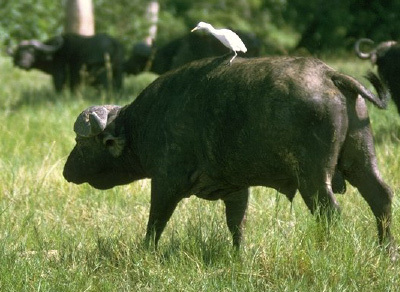 This can be very successful - cape buffalo (below) herds in Africa have been seen to contain blind and even three-legged members. 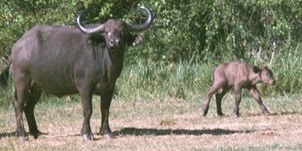 A cape buffalo (Syncerus caffer) and calf. XH19-18.6 Bos taurus skull (young heifer). 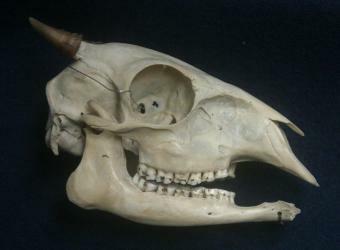 This skull of a young female domestic cow, and that of the zebra (Equus burchelli), a perissodactyl, show several similar features, despite their belonging to different orders. This is the result of convergent evolution as both species have skulls adapted for a diet consisting mainly of grass. many hypsodont, crested teeth to grind up grass, which contains silicates that rapidly wear down the teeth. 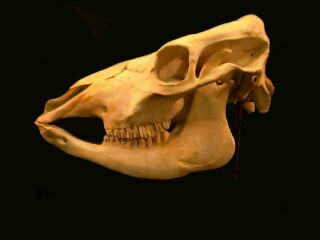 a long face, and deep lower jaw, to accomodate the teeth. 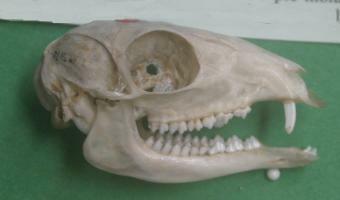 eyes set far back on the skull, allowing a wide field of sight and some binocular vision. 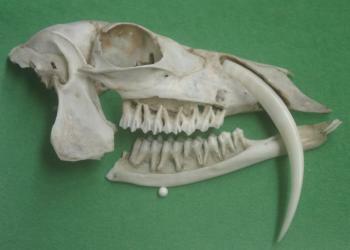 However, the skulls are still recognisably different in other respects - the cow lacks upper incisors, for example. The bovids are divided among 6 subfamilies. Long-horned cattle in East Africa. The desire of local inhabitants to graze their cattle on the plains of Africa brings them into conflict with the local wildlife. 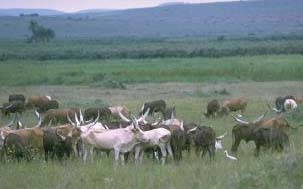 The cattle compete for grazing with native ungulates, and are at risk from diseases carried by other, wild bovids. In addition, the cattle are at risk from predators. 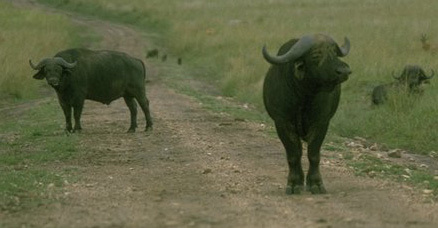 Cape buffalo (Synceros cafer) are the largest bovids. They live in herds of up to 350 animals. Sheep and goats are two of the most commonly farmed and ecomomically important ungulates. As well as providing meat and milk they produce wool - soft, curled hair used the world over to produce garments. 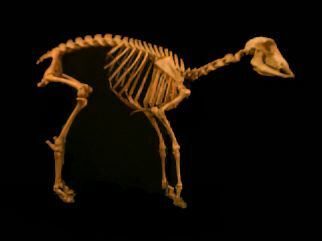 XH19-1.1 Skeleton of lamb (Ovies aries). Sheep are one of the most important ungulates to man, farmed for their meat and their wool. There are many different breeds of sheep, the result of centuries of selective breeding by farmers. Goats are often herded in semi-arid areas where there is not enough grazing to support cattle. The herding of goats in sub-Saharan Africa is a severe problem, leading to overgrazing and desertification. 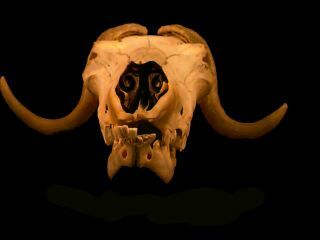 XH19-20.1 Ovibos moschatus skull (frontal view). The musk-ox is a heavily built animal of the tundra. The horns of the male musk ox are larger than those of the female. Herds of musk-ox will form circles of adults facing outward, with the calves protected in the centre of the circle, as a defence against wolves. Its size, of course, is an adaptation to the extreme cold as is its huge shaggy coat. Similar adaptations are seen in the yak of Tibet. Remarkably, yaks ruminate at 40 C, keeping the animals warm on the cold mountainsides. 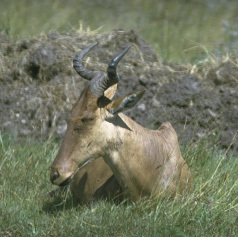 The grazing antelopes (23 species in 11 genera) inhabit the great grasslands of Sub-Saharan Africa - while some inhabit wetlands (kob and lechwe) and moist savannah (topi), others inhabit moist grassland and open woodland (hartebeest and wildebeest), and yet others the arid lands (oryx and addax). 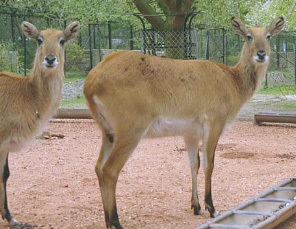 Two red lechwe (Kobus leche). 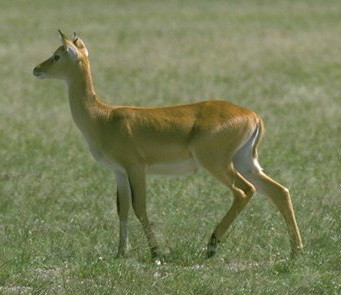 Lechwe are commonly found grazing in flooded areas, eating grasses growing in shalllow water. Lechwe are vulnerable to hunting and drainage schemes. 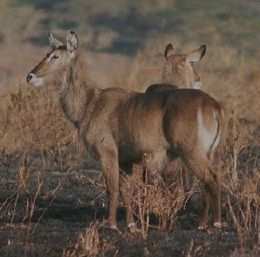 Waterbuck (Kobus ellipsigrymnus) are closely related to lechwe. 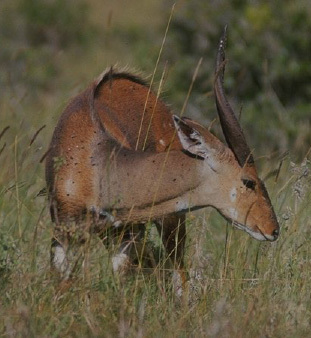 The hartebeest (Alcephalus bucephalus) is another antelope from Africa. 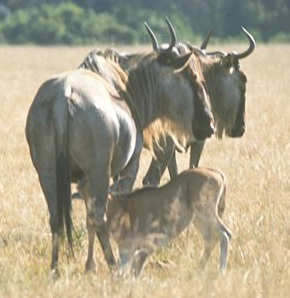 Both topi and hartebeest are closely related to the wildebeest. Two wildebeest (Connochaetes sp.) and a suckling calf. Wildebeest (also known as gnu) are antelopes, although they look rather like buffalo. They are famous for being found in herds of hundreds of thousands of animals.These herds migrate in East Africa in order to find ample grazing. 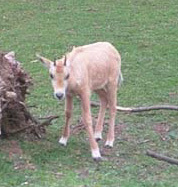 As in many ungulates, the young are able to walk within minutes of birth. Calves must be able to run with the herd should danger threaten. 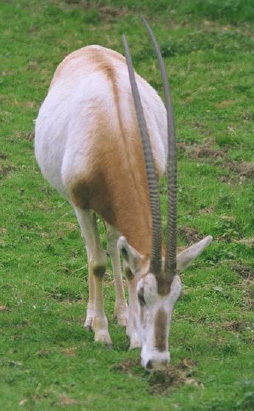 An Arabian oryx (Oryx leucoryx). The incredible horns of all species of Oryx are distinctive amongst the bovids for their size and straightness. A scimitar-horned oryx (Oryx dammah), showing the impressively long horns. Oryx often live in very dry areas, and can go months without drinking. The Arabian oryx is very rare and may not be saved by current captive breeding programs. It was formerly exterminated in the wild, but was saved from extinction by the actions of several organisations, including the government of Oman. The scimitar-horned oryx is also at risk due to the grazing of cattle on the borders of the Sahara.desert. It has become extinct north of the Sahara. The addax was once distributed across the whole of the Sahara but its range has shrunk, especially in the east and the addax is now endangered. 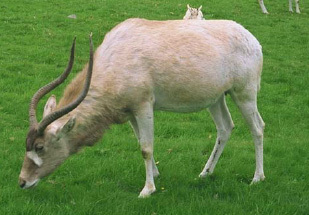 The ancient egyptians domesticate the addax and the related oryx. 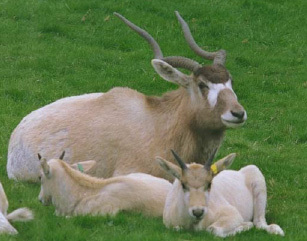 An addax with calves. Note that the horns have only recently begun to develop on the calves. The horns of bovids are covered in keratin (the same material that hair and nails are made of) and neither the bone inside and the keratin are shed throughout life. Gazelles are another familiar and abundant type of bovid from the African plains. 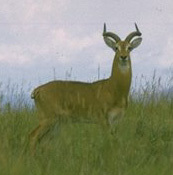 Females (above) have smaller horns than males (shown below). Duikers are mostly forest dwelling animals that occur only in sub-Saharan Africa. 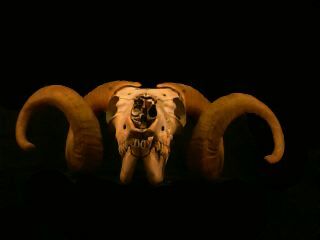 Their skulls have thickened and enlarged frontal bones and their short horns grow far back on their skulls. These features appear to be linked to the very hard-heading butting that many species direct at rivals and predators. Maxwell's duiker lives in rainforests and moist savannah in West Africa and feeds on fallen fruits, herbs, shrubs and new shoots.